Sponsored by Nordstrom. 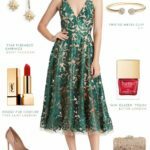 Affiliate commission links are also used in this post about ideas for spring outfits for celebrations. Spring brings a renewed and refreshed approach to just about everything, and it’s a time for lots of celebrations! Spring weekends often mean bridal showers, outdoor garden weddings, Kentucky Derby parties, and Easter celebrations. It’s also the time you’re probably looking at your spring wardrobe from last year, and thinking it could use a few new pieces for the warmer season. 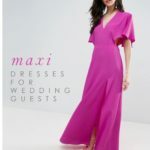 No matter what you have planned in the next few months, the conundrum of what to wear can be solved by checking out the latest spring offerings at Nordstrom! Nordstrom is one-stop shopping for every gender and age group, with top names in clothing and beauty, and styles for every budget. Picking up a few spring pieces now, will help you be styishly ready to go when that first spring event happens. Here are three looks that will take you to Easter, spring parties, and bridal showers. 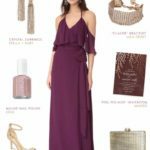 These looks also can be worn again for spring weddings. Jumpsuits in formal fabrics like this one can go to church events, pre-wedding parties, and weddings themselves. Just add a wrap or dressy blazer if you need shoulder coverage for certain settings. This dressy jumpsuit in a pretty spring color and fabric is a great look to add to any closet. I envisioned it here as an Easter or spring bridal brunch outfit, but you can also wear it to a daytime wedding. If you get tired of dresses, or they simply aren’t your style, a jumpsuit in a pastel shade and in a formal fabric is a versatile piece. Wear it with daytime sandals and accessories for brunch, add more sparkling accessories and heels for a wedding. 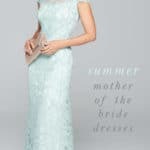 It’s also a beautiful look for a guest to wear to a rehearsal dinner, or a beach or destination wedding. This lavender lace dress with 1/2 sleeves is the perfect color and silhouette to wear to a variety of spring events! 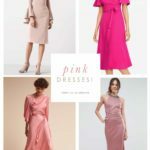 If you’ll be dressing up for holidays like Easter, or other spring-time celebrations like graduations, Derby parties, or showers, you may want to invest in a dress that can be worn to several of those events. I love this lavender lace dress for that reason. It’s ready for church, spring family photos, holidays, but can also be a beautiful dress for an afternoon spring wedding, or for a dressy bridal shower! This is styled here as an understated daytime look. 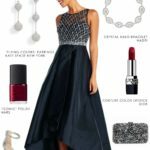 Just add an evening clutch and more formal earrings, heels, and accessories and you’ll be ready to wear this to your next spring wedding. An elegant and relaxed tan cotton suit for spring, with accessories in spring shades. I get so caught up in spring dresses, that I neglect to create outfits for the gentlemen. This look solves that issue! This spring suit could be worn for Easter Sunday celebrations, then to daytime spring and summer weddings. It also comes in a dapper blue chambray. I love all the suits like this from Bonobos; they’ve nailed the perfect dashing suit styles with their tailoring and fabrics. It’s a great look for summer grooms and groomsmen as well! In the accessories, that four paneled pocket square can be 4 different ways to get 4 different looks, and makes a great unexpected and practical accessory and gift for groomsmen. 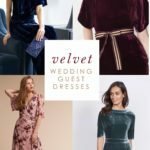 Do you often feel at a loss for what to wear each spring, and wish you had some personal styling help? Nordstrom has free styling services available for everything from beauty to weddings to every day style. If you can’t go in-store, Nordstrom will have stylist curate a look just for you and will digitally send you a style board with their suggested look. It’s a great way to get some outfit ideas. There’s also no obligation to purchase the items, but you’ll probably want to after you see your new look! Suits and special events call for the fit of your clothing to be just right. Nordstrom offers tailoring to make sure the suit, dress, or any other piece of clothing fits just perfectly. The best part? This doesn’t just apply to new Nordstrom items. 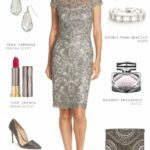 Nordstrom will alter any item in your closet, it doesn’t need to be from Nordstrom! You can book an appointment online. The alteration process is quick and easy. Get that custom look and correct fit for every piece of spring clothing you own. Here are some more of my picks from Nordstrom for sprucing up your look for spring. 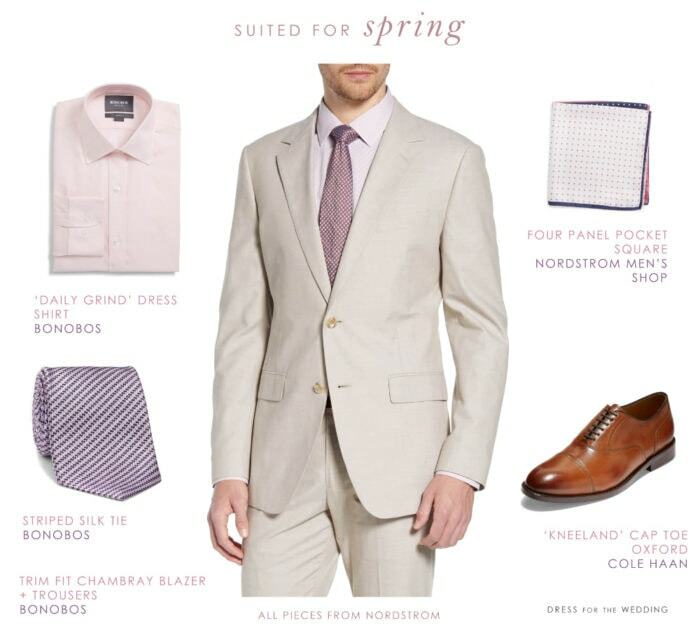 Be sure to come back to see tomorrow’s post where we’ll look at some more spring looks for weddings from Nordstrom. Sponsored post. Affiliate commission links are also used in the products featured in this post.